And so, unless stale stories, bad acting and bungled possibilities capture your fancy, Blood Money is much too sluggish, simplistic and boring to bother. A young man tries to take dreadful shortcut to success; but his ambitious overdrive lands him in the underbelly of the diamond mafia. Will it be worth the blood? What kind of a Jannat is this? 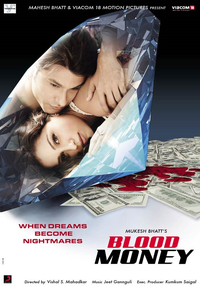 Blood Money fails to entertain the audience in spite of having a potentially good subject. "Blood Money" dives into a cesspool of predictable characters who we know are heading nowhere. And we couldn't care less. What's it about: A middle-class guy Kunal (Kunal Kemmu) is fed up of being a delivery boy and leading a life of squalor in Mumbai. The furthest he can afford to take his wife Arzoo (Amrita Puri) is Madh Island. It has run of the mill set up, tolerable acting, straightforward screen play and unmemorable music. Blood Money bleeds boredom. Watch some of Mahesh Bhatt's earlier hits instead. The promos have pretty much established the storyline of 'Blood Money'. Kunal Khemu is a honest professional who gets sucked into the world of corporate crime as he joins hands with a bigwig (Manish Chaudhary). Expectedly his wife (Amrita Puri) is not too happy with the developments but the lure of 'bangla', 'gaadi' and 'ladki' (in this case, Mia Uyeda) is good enough to stray our leading man. In the middle of this all there is another evil man (Sandeep Sikand). Of course there is the middle act where Kunal lets go off his conscience, only to emerge as the one who would battle it all out in the third act. All it takes to make a great movie is to have vivacious, good-looking and incredibly talented lead actor who has the ability to convince the audience his/her role. And Blood Money’s got Khemu to gloat about. Not to mention, a great story line too.